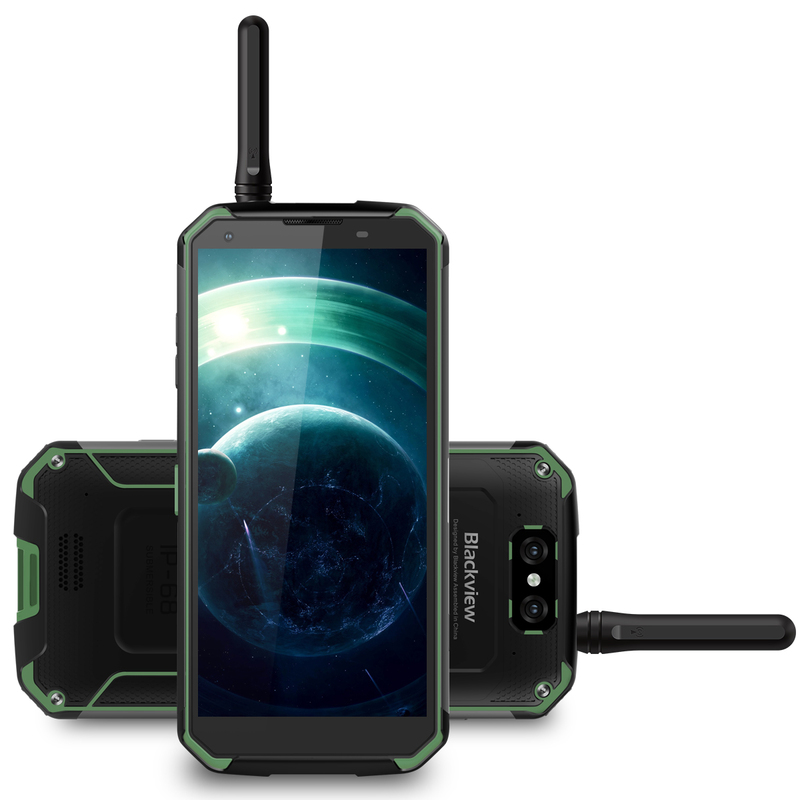 Successfully Added Blackview BV9500 Pro Mobile Phone Android 8.1 10000mAh Battery IP68 Waterproof NFC OTG Smartphone (Green) to your Shopping Cart. Helio P23 (MT6763T) octa-core 64bit up to 2.5GHz CPU, high performance, combine with 6GB+128GB, run faster and operate more smoothly. 5.7 inch FHD+ IPS 2160*1080 screen, 3-generation Corning Glass, 18:9 ratio, full angle, 16.7M color temperature display, big view, vivid color. 13.0MP front camera clear for video chat and selfie, 16.0MP+0.3MP dual back cameras with flashlight, good for taking clear pictures. Powered by 10000mAh high capacity battery, charged by 9V 1.5A, support wireless charge. Inside the tough exterior of BV9500 Pro lies massive energy--a 1000mAh battery custom-crafted to pack maximum performance into a ruggedized body. With so much power at your disposal, you can do more online, stream longer videos, and talk as much as you want without worry about getting through the day and days after. Full range of low-power design from hardware to software for BV9500 Pro, resulting in following data tested from full power to exhausted. Leading edge 12V/2A 24pin TYPE-C Quality Charge Technology, more than 2 times faster than normal 5V/2A charge technology. 1000mAh is fully charged via 3.5 hours. Charging wireless with BV9500 Pro, adopts with wireless fast charging standard, feel free to charge wireless in wherever offers QI wireless charger. With a bright 500-nit IPS display, Full HD Plus resolution, and a solid Corning Gorilla Glass on top. BV9500 Pro makes photos, videos, and all your other content look as vibrant as real life. With MediaTek MiraVision. The advance octa-core processors operate up to 2.5GHz keeps a sustained high-performance and reliable consistent user-experience. The upgraded Mali-G71 MP2 GPU running up to a speedy 770MHz guarantees smooth gaming. The latest TSMC 16nm FinFET production process, powering premium experience that is also light on battery use. The perfect balance between performance and consumption, that's the ultimate goal we always pursue. BV9500 Pro features an advanced dual-camera system designed to take your mobile photography to the next level. Its 16MP main camera is equipped with a big F2.0 aperture lens to capture clearer photos. Combined with the depth of field sub-camera, BV9500 Pro can produce the beautiful photo with creamy bokeh effect. While the BV9500 Pro keeps up with your active lifestyle, the 13MP front camera is always ready to capture extraordinary moments with you and the natural. 6GB high-speed RAM lets you fast and smooth switch between multiple apps, 128GB ROM allows tons of media and files save on internal storage. If it still not satisfy your need for huge space, BV9500 Pro also support expansion SD card. BV9500 Pro is IP68/IP69K certified rating waterproof and dustproof, which means it offers the highest level of protection against dust, handle not just a brief dunk in water but also complete submersion under 1.8 meters up to 2 hours, furthermore, it can resist 1450 psi high-pressure and 80℃ high-temperature steam scouring. So you can feel free to go to the sea, to the river, to the mountain, to the desert, to the Gobi, to the forest, to the valley, to the island. They're no match for this intercom rugged smartphone. Because it is built for the extreme, just like you. Unlock in the blink of an eye, much safe and more convenient to protect your personal privacy information security. The BV9500 Pro comes with full-featured NFC, supports card reading, card writing, card emulation, and P2P mode. After successfully binding the bus card and bank card, the mobile phone is your one card solution, take the bus, take the subway, brush POS machine, pay with your BV9500 Pro. GPS + Glonass dual satellite positioning technology, BV9500 Pro can receive both of the signals at the same time for more accurate positioning. Even able to meet the requirements of complex environmental operations under severe shading conditions. Smarter, faster, more powerful and sweeter than ever. The world's favorite cookie helps BV9500 Pro achieve the most floating experience you ever have seen. BV9500 Pro supports numberous frequency bands and offers incredible performance in global 4G network, compatible with various carriers in different countries regions.